RealSchool is the academic program I created to promote whole-person, inquiry-based, student-centered learning. I posted this blog post on the RealSchool blog and am cross-posting it here, as I'm always looking for what educator Jon Mitzmacher calls "thought-partners." your students create the videos about the content to flip the classroom. involve your students in lesson design. Be partners in unpacking the standards and designing activities. Children today are very resilient and smart if we give them the chance. 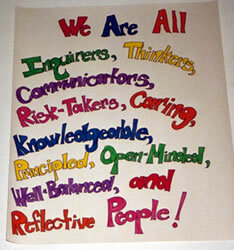 Check out this post from Kathleen McClaskey and myself on Personal Learner Profiles and the Common Core. Ask your students to brainstorm and prioritize questions about the topic. This post on Making Just One Change where I interviewed Sara Armstrong helped me understand the importance of inquiry. Michael Wesch encourages his university students to wonder. Imagine your students building lessons with you as partners in learning. 1. Time- Pro-D, preparation, planning & play – CSS [his school in Canada] has significantly more prep & planning time than most public schools could ever afford, but I do think we have to start being creative about the amount of time teachers spend in front of students vs how much time they spend collaborating and learning… after all, we are just as much in the learning business as we are the teaching business. 2. Co-teaching & collaboration opportunities - I think this is where we can start to get really creative in two ways: First, we need to get two teachers in the same room, including doubling up the classes and having 50-60 students in a larger room, or in learning commons. Secondly, blended learning models could mean that at times, one teacher has 2 classes that are using a technology guided program or activity, freeing up extra time for other teachers to meet. It is ironic, and unfortunate, that tighter class size limits are factoring into play in BC right when blended learning is going to push the envelope of continuous supervision of students in set classes. 3. Models & Mentorship - We actually have working models like the Calgary Science School to examine. At CSS new teachers are told not to plan anything until they meet their colleagues. New teachers aren’t handed the toughest positions, and they aren’t handed packages of work or set programs to teach. As Stephen Heppell says, “…you get ideas from colleagues, and from other schools, and… when your experience touches someone else’s experience”. We have a case to make, I think, for valuing the immeasurable over that which can be easily measured, and that the powerful role that schools can play now is not delivering that narrow curriculum (which is now in a million places) but in developing the skills and dispositions or the “opportunity to participate in civic and deliberative discussions” which, at the end of the day, is kinda hard to machine score. It’s not an easy case to make in this world of competition and ranking and sorting. But it is where our real value is now. How we articulate that value and move it into the mainstream thinking is where our collective laser focus needs to be.